PepsiCo Canada‘s marketing team was deep into a brainstorming session last fall with its agency, BBDO, when they heard a knock at the door. It was a special surprise delivery in a long white box. Right away, Matt Webster, marketing manager of PepsiCo’s young and hungry portfolio, gave the box a shake, hoping to figure out what was inside. The creatives from BBDO looked on in dismay – the contents were fragile. When Webster opened the box, he found a bouquet of long stemmed roses wrapped in red tissue. 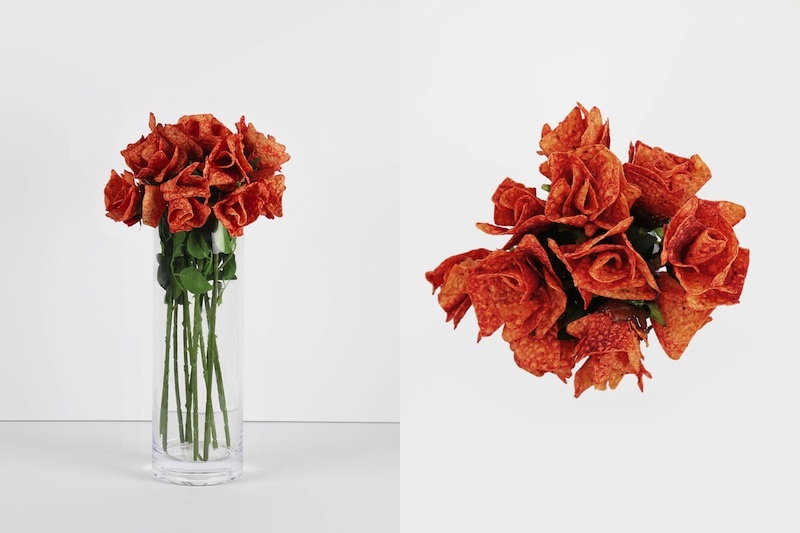 But they weren’t just any roses – each flower was made of carefully pieced together Doritos chips. Webster was pleasantly surprised. His team had been looking for a way to promote its limited run of Ketchup Doritos and BBDO had found it. The idea was a fit for the brand, which prides itself on being bold, irreverent and part of popular culture, and it delivered on another ask from PepsiCo’s brief: timeliness. Ketchup Doritos were scheduled for a roughly four month run starting Jan. 25 and the team figured it could position the flowers as a quirky Valentine’s Day gift for men. BBDO set to work with a team of food stylists, testing out the best way to put the arrangements together. The finished products, which Doritos gave away for free on its website, were put together by hand using a vegan kosher beat sugar isomalt. According to Webster, each bouquet of 12 long stem roses (the stems are plastic) took about two hours to put together. The bouquets were arranged in a food safe site, but Webster said the brand is not recommending recipients actually eat them. Instead, each bouquet comes with an accompanying bag of chips. Within hours of the Tuesday morning launch, the brand had already given out the roughly 100 bouquets it made for consumers in Toronto, Montreal and Vancouver. For those who missed out, BBDO created a do-it-yourself guide to creating the roses on the campaign’s microsite. To further promote the stunt, BBDO shot a ’70s-style informercial, which is meant to complements the bag’s throwback packaging. Ketchup Doritos are unique to the Canadian market. PepsiCo brought the flavour back after a 10-year hiatus in 2013. At first, it scheduled the run for just five weeks, but after seeing how well the chips sold, it extended the run to 10 weeks in 2014. According to Webster, the run sold out just half way through its intended availability, which led to extended runs in 2015 and 2016. This story can be found at: http://marketingmag.ca/advertising/doritos-creates-ketchup-chip-bouquets-for-valentines-day-167723.